February is a good time to target a lot of different species. From pompano, jacks, sheepshead and sharks around deeper cuts to snook, reds , flounder and trout along the mangroves, bridges and docks. During this time the water is a lot colder than most of the year. When fishing the flats around mangroves, hit the water a little later in the day and target sand holes and areas with dark mud. These spots will warm quicker than surrounding areas and should be holding fish. Remember snook season opens February 1st. Tripletail is another great target this time of year. Launch near structure like crab pots and channel markers; they are great places to find these fish. 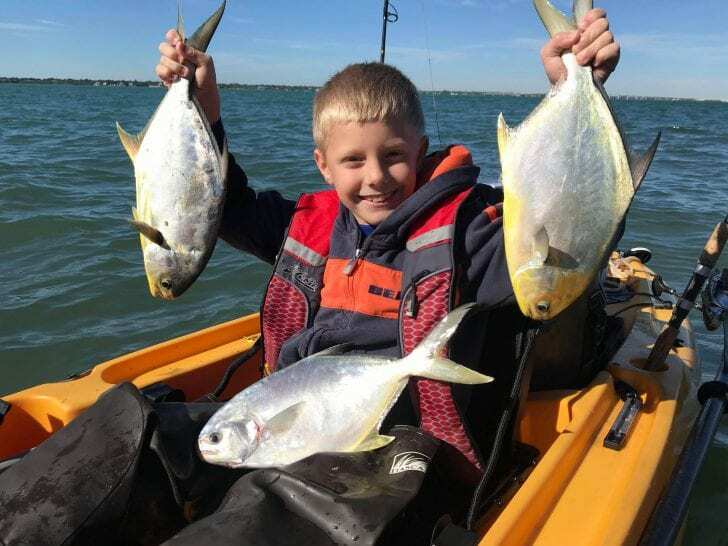 Braden Nelli with his first couple of pompano. Come February cobia is on the mind. These fish will start to move into the beaches following around the rays, sharks and turtles. I like to have a DOA Swimming Mullet ready to pitch to them when spotted. Sailfish, kingfish, wahoo and dolphin will also still be frequent catches in February. Look for these guys to be found from 90-120 feet chasing goggle eyes, pilchards and blue runners. Finally don’t forget about the nearshore bite. Spanish mackerel and bluefish should give a lot of action off most beaches around Palm Beach County. Check out Pushin’ Water Kayak Charters on Facebook, Instagram and Youtube for all the latest adventures my clients and I get into.